Now as an educator working in school I do not drink from the drinking fountains. I did when I first started teaching though. I got every illness going through the school and then one day I saw a little kid put her whole mouth over and around the spout (I see students doing that all the time). I never drank from the fountain again. And my health improved dramatically. Of course getting sick a lot during your first year is a rite of passage. I felt like the school hazed me. When I take my students to the fountain, occasionally they grimace and wipe their mouths, “It’s hot.” As a kid I would drink out of the hose outside during the summer and it was often very hot until I let it run for a minute or two. Now I wonder how many chemicals I ingested by drinking out of the hose (see Dangerous Lead Levels Found in Some Garden Hoses). Of course the water at school is not coming from a hose that has been sitting out in the sun for several hours leeching god know what into the water. But what about water quality at school? Should parents worry about this too? There isn’t much about school water quality online (hint: journalists get on it). When I searched Google, I found one article from September 2009: Drinking water unsafe at thousands of schools. The article makes mention of schools who get well water being the most at risk. That makes sense to me having lived in rural places where we didn’t have access to city water. We had our water checked every couple years. Giving your child bottled water is not the answer as that leads to increased consumption of single-use plastic. All water must be safe for children at school. We need to support the Clean Water Act and have all schools come into compliance. If you have concerns about water quality at school, you could send your child with a Klean Kanteen water bottle or the equivalent. I think parents should have access to the water records for the school that their children attend. I’m all for transparency. You know, as clear as the water should be. My elementry school had well water but once I got to middle school it was 'city' water all around. So if you send you kid to school with a reusable bottle filled with water and they drink it all? I keep seeing bottle with small filters inside. I keep thinging to myself "I wish I was still in high school to use this". You seem to be complaining about everything. Just focus on what your blog's about and do this later. What won't kill you will make you stronger. A very thought-provoking post… Even as a child I was a little freaked out by the water that came out of the fountain. And it is shocking that this hasn't been covered more by journalists. Thank you for saying that bottled water is not the answer. @ years ago I bought some Sigg bottles and pledged to not drink bottled water for an entire year. I did pretty well. I think I drank maybe 2 liters of bottled water for the entire year, and I think that is not bad since I was pregnant at the time and drinking a ton of water. There were a couple times where it was more important for my baby to get hydrated than for me to wait to get to a drinking fountain. But I digress. In Barbara Kingsolver's Animal Vegetable Miracle her husband writes a very interesting article saying that drinking water is regulated by the Health Department (or similar agency, forgive me it has been a couple of years since I read it) whereas bottled water is regulated by the FDA because it is a product of business. The regulations of tap water are often stricter than that of bottled water because of the regulating agency. I've done wildlife presentations at various schools, and I'm impressed by the classrooms where all of the students have reusable water bottles. Having water at their desks reduces the number of times the kids get up to go to the drinking fountain and increases hydration. I work in a preschool, in a church. There are 2 water fountains. Children are only to use a paper cup if they get a drink from the water fountain. Last year we started taking jugs of water to our classrooms. As for Anonymous above, Without a school lunch every day I think it is a good idea to bring other issues having to do with our children and schools to the table so to speak. In fact I think we could go further and ask Why don't schools offer water to children at lunch? My girls would have been more likely to drink water than the milk that was served. Unfortunately, it would be bottled water, because they would not be able to think of any other way to serve it and that would be bad from a trash/recycling point of view. I was so surprised that the USA ships a lot of it's used plastic bottles overseas. Amazing. I can't speak about the "quality" of the water; however, in college, as part of a biology class project, we had to swab different "public" areas prepare petrie dishes then wait to see what microorganisms were present and to what extent (count). My lab partner and I thought we would have a plethora of things growing, as we swabbed the water fountain and the ladies restroom . . . both came up surprisingly "clean" as compared to other areas students swabbed. Granted, this was a college water fountain, and most individuals are not putting their mouth OVER the water spout. I agree that this is an important issue and not just complaining. Reason #46 why I hate all of you (humans and disease-communicable animals): You're dirty and gross. I recently became a new homeowner and I purchased a home with a private well. Previously, I had always lived in places with "city water". It was during the purchase process that I realized how truly little I knew (or even bothered to know) about my tap water. First of all, any drinking water expert will tell you that public water supplies (City Water) are heavily regulated, regularly tested, and processed at the source. It's the pipes that bring it to your home and, more frequently, the pipes IN your home that you need to be weary of. Older homes have lead pipes or lead-based soldier on copper pipes. Private wells are entirely another story/problem. Well water is regulated at the state level, if at all (and most often, not). Testing is usually optionally done by the home buyer during the purchase process and rarely thought of again afterwards. If you have a private well, your water is coming out of the ground around your house and underground "streams" feed your well sometimes from as far as several miles away. What your neighbors do in their yard affects your well. If one neighbor works on cars and dumps a bunch of harsh chemicals into the grass or into his septic system, traces of those chemicals can end-up coming out of your kitchen faucet. Your well water, if it's in bedrock, can also contain Radon, which is a fuzzy/lengthy topic I won't go into details on just now. Needless to say, it's imperative that all homeowners with wells test water periodically (every few years?) for safety. It's upwards of $300 for a "full battery" of tests but it's worthwhile. A good, state-licensed lab can tell you everything that's in your water from micro-organisms to toxic chemicals. After learning this, I think I'd even periodically test my water even if I had City water and I always use a good quality water filter for drinking and cooking water. Point-of-Use ones (under the cabinet) with carbon or carbon-wrapped filters work best in most situations and beware of "reverse osmosis" systems, which don't eliminate a good chunk of contaminates. Believe it or not, a Brita filter is better than an expensive reverse osmosis system. Now what about your school? If they have city water and the building's plumbing is fairly new, I'd say you have few worries aside from the cleanliness of the drinking fountains and taps. If your school has a well, I think I'd become an advocate and push for for periodic published testings. It's a great idea. In fact, my town probably has wells in its schools and it's definitely something I'll look into when I have kids entering school. Thank you, Mrs. Q., for opening this door of conversation. I think it was a good one! This story is what made me really start questioning the quality of what comes out of our fountains. Dozens of elementary school students were sickened Tuesday after they drank pink-tinted fountain water that was contaminated by a leaky air conditioner, city officials said. It is mandatory at my daughter's school for them to bring a water bottle every day that they can keep at their desks. I usually fill it up with ice and a little water so that when the ice melts the water stays cool. BLEECCHHH! I ran out of water one day and refilled my bottle out of the fountain in the cafeteria that the kids take hundreds of drink out of every day. It was so FOUL tasting I couldn't drink it. The fountain never gets cleaned – I would clean it when I remembered but it was obviously not done by anyone else. In fact I'm going to add that to the morning checklist in September *who ever puts out the supplies for the day also cleans the water fountain. Excellent topic, Mrs. Q. If 10% of our nation's school kids are drinking water from fountains fed by water supplies that aren't regularly tested for potability, then aren't we sending 10% of our kids to school in a third world nation? When did we lose sight of this basic human health requirement? Kids need to be taught to drink from fountains without putting their mouths, lips or tongues on them. My parents and grandparents drummed that into my head from an early age. Isn't it just plain common sense for teachers and school administrators to do the same with today's school kids? If the water coming out of the faucet is hot – that becomes a bigger problem. Many contaminants are better absorbed in water if the water is hot. You can try this yourself with sugar – add a bunch of sugar to water and keep adding it! You will notice that the water keeps absorbing it. Now allow the water to cool – put it in your fridge or whatever – and when it gets colder, you'll notice sugar will start to fall out of the solution! It's called a super-saturated solution! That's why you should never use hot water for drinking or cooking. Whatever nasty stuff that is laying in your piping will only be more present in your water if you drink it while it's hot. The sugar experiment might be a fun thing to do with your class! And it might change how they interact with water at the fountain and at home! Very interesting post. Thank you for making this point, it was somthing I had not considered. 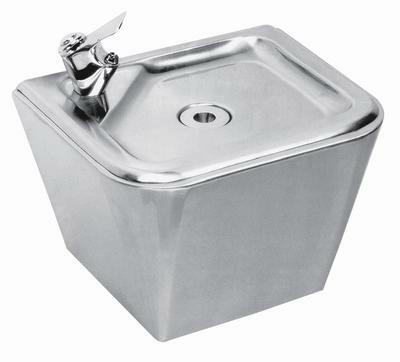 I always avoided the school water fountains when I was teaching, I actually never drink out of water fountains anywhere for fear of illness. My favorite ed professor in college gave this advice on how to survive years of teaching "Wear comfortable shoes, and don't drink the water." He's a wise man, for many reasons, but I always think about that when I pass a water fountain. I haven't drunk out of a public water fountain in ages, but I agree with you that the kids (and there were always a few) who put their entire mouth on the fountain were just gross. Who taught them to do that? What purpose does it serve? I am fortunate enough to live in a place where the tap water is of very high quality, and I believe that it is our state's requirement to test it annually. We get a card in the mail telling us of the results. At my workplace most people use re-usable water containers. We also don't have any paper plates, cups or plastic utensils. I am still amazed at the single portion lunches your school provides (that was not the norm when I was in elementary school in the 70's and 80's) and also have to add to your trucking post that most food sold at grocery stores, even in CA, are shipped to a central "hub" for redistribution. Therefore, even strawberries and lettuce grown 70 miles from you may have traversed hundreds of miles before it makes it to your kitchen. That transport also accounts for the hybridization of fruits and veggies to make them more hearty and visually appealing after traveling so much rather than retaining their nutrtional value and flavor. It's something to keep in mind when you are frequenting your local farmer's market. I do not let my kids drink from the school fountain. In third grade my daughter had strep throat 4 times in a year. At $30 a Dr. visit and not to mention your child feeling sick and antibiotics. After that I said no more water fountains and we do bottle water, which we recycle the bottles! Way too many germs on the fountains. Growing up in the Fifties I, like so many of my generation, was taught that the government was watching out for our food and health safety. It seems every day we learn all over again just how untrue that can be, and I agree with you. Every school should be testing its water and sharing the results with the general public and any parent who wants to see them. More, the results should be in lay terms so ordinary people can understand them. I know that somewhere I read that in some schools they don't allow children to drink from the fountains because of having an aging water system within the school. Instead of fixing the system they just buy bottled water because they feel that it's cheaper. I really remember playing in the water fountain that there was on the playground and thinking back I can't imagine how many germs were in that thing. I think I was in junior high the last time I drank from the water fountain. The only problem that the reusable/refillable bottles poses is once at school how do you fill them up again? I remember drinking from the water fountains at school. I also remember the day they shut down the fountains because asbestos was found in the auditorium ceiling and they couldn't guarantee it hadn't gotten into the pipes. We use reusable bottles in our family now, but my daughter (2), loves water fountains, and every time she sees one, she insists on drinking from it. Many manufacturers are addressing water quality of drinking fountains and water coolers. Wouldn't it be cool if every school had one of these so kids could fill up their reusable water bottles? Here are some white papers about increasing water comsumption in schools and other places. I've often wondered as I'm taking a sip from my kids' school water fountain if I ought to think twice – your image of the girl with her mouth on the spout is going to stay with me a long time! And I totally agree with the other issues you mention. Don't know if you saw the multi-part article in the New York Times that ran this year about water quality and the lax enforcement by the EPA? Very scary stuff. the school I teach at is over 100 years old with multiple plumbing problems. The water fountains taste funny to me. I'm guessing it is due to the pipes? I am fortunate because our PTA helps pay for a filtered water system in the teacher's lounge. I fill up my reusable metal water bottle there several times a day. When I was in middle school (late 1970's) the water in our school was so foul tasting that I got involved with a group of kids that went to the school board to give a presentation on how we wanted better water. And this wasn't for a school assignment – it was just because we all hated the water. The school board was impressed and shortly after that they installed water coolers all over the school. I hate public fountains – no matter where they are. At the school I work at our water is contaminated. It is tested every year by the health dept. We have several water coolers like the ones you normally see in offices on campus. Most kids bring bottles of water from home. However no one thinks anything of washing their hands with the contaminated water. One of the teacher aides even told me that as long as I didn't put my hands in my mouth I would be ok. Apparently she doesn't realize that when she eats her sandwich she is touching her food with dirty hands. I use hand sanitizer and wipes but still feel weird about not washing my hands. Oh and our water is contaminated due to pesticides because the school is located in a agricultural area. However we are not rural we are located in the suburb of a medium size city in California. I remember back when I was in elementary school, I was in music class, and there was an announcement over the PTA from the principal that there was a chemical leak in the town's water supply and that we shouldn't drink the tap water. Shortly thereafter, my parents bought gallon jugs of filtered water from the grocery store and we refilled them once a week. We stopped doing that after we bought a fridge with a built-in water dispenser and filtration system. I was one of the few kids at my school whose family did this. No one here has mentioned that the water might not be as much of a problem as the handle on that water fountain. Everyone touches the handle, and it's not being rinsed off by stream of water like the fountain itself. Also, so many of you seem to agree with the commodification of water. Good, clean, safe public water supplies ought to be available to all. If good water can only be achieved by buying bottled water and decanting it into specially designed bottles, there is the problem. We have water fountains at our school but the water is warm and it comes out cloudy. The cloudiness disappears after the water sits a while, but YUCK…that's enough to keep kids from drinking it. (I've been told the cloudiness is caused by oxygen bubbles???) The PTSO bought a purification system which is in the teacher's lounge and is great – for the teachers. But what about the kids? Since I preach to them the many benefits of drinking water, I fill up a 5 gallon jug every morning (with ice and water) simply because I want them to drink WATER. At the beginning of every year, I only have a few who bring their water bottles to refill. By the end of the year, I'd say at least half of the kids are bringing their bottles every day and refilling them in my classroom. Most days I have to refill the jug a couple of times and I'm very happy to do it! Brains need water to function properly. Many headaches are simply dehydration! If I have a student with a headache who wants to see the school health-aide (we don't have nurses any more), I always make them drink a glass of water and this usually cures the headache. I think all kids would be healthier and function better in the classroom if they were provided clean water and encouraged to drink it throughout the day. As well as feeding kids good nutritious food, schools should also make sure their water is drinkable.